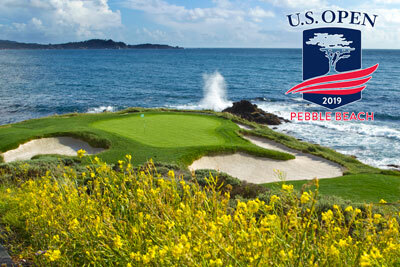 Pebble Beach Golf Links was selected by the United States Golf Association (USGA) to host the 2019 U.S. Open. The Open, which was first conducted in 1895, is one of 13 national championships conducted annually by the USGA. Mark your calendar now for this exclusive event. Don't miss a chance to see history in the making! Buses leave about every 15 minutes from the front of Carmel Plaza on Ocean avenue and go to Pebble Beach by the Equestrian Center. Tickets can be purchased at the Carmel Visitor Center prior to the event or the day of at the Pick-up location in front of the Carmel Plaza.